This month I’m cheating a bit: these are all recipes I’ve made, but I haven’t made them all in August. Who has time to work through a cookbook when they’re moving to Prague?! It’s been a very busy month, and getting the kitchen fully-stocked is a work in progress, so while I get my act together, here are some tasty treats from Salad Samurai. I never thought I’d purchase a salad cookbook, but this isn’t a book full of boring, leafy salads. These are tasty, hearty meals, and I really recommend the book to anyone looking for something a bit different. It’s organised by season, and I’ve been trying to stick to summer and spring lately. And breakfasts! Surprisingly, there is a breakfast section in the book. I know. Initially I was wondering what kind of monster would even contemplate a salad for breakfast, but fear not: it’s basically just porridge and granola. 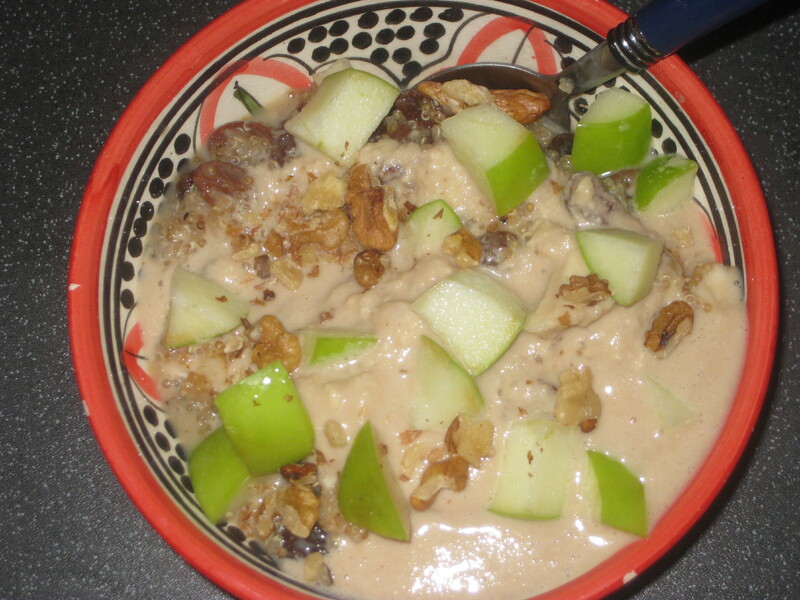 The first breakfast recipe I tried was this one for overnight oats with Mexican chocolate cream. It was very easy to make, and the chocolate cream was really delicious, with a lovely kick of cayenne pepper. Best of all, the recipe makes enough cream for two days in a row. I make this all the time now, and have already made some in Prague too. …and also as part of the smoothie bowl: a smoothie topped with granola and an assortment of delicious things, in this case dried apricots, cocoa nibs and coconut. It was extremely filling, and I loved the crunch of the cocoa nibs, but I think I might have preferred the usual co-yo topping with a smoothie on the side. Some people just don’t like mixing that much. I also tried the apple quinoa a la mode, which was just like apple pie (albeit without the best bit: PASTRY). 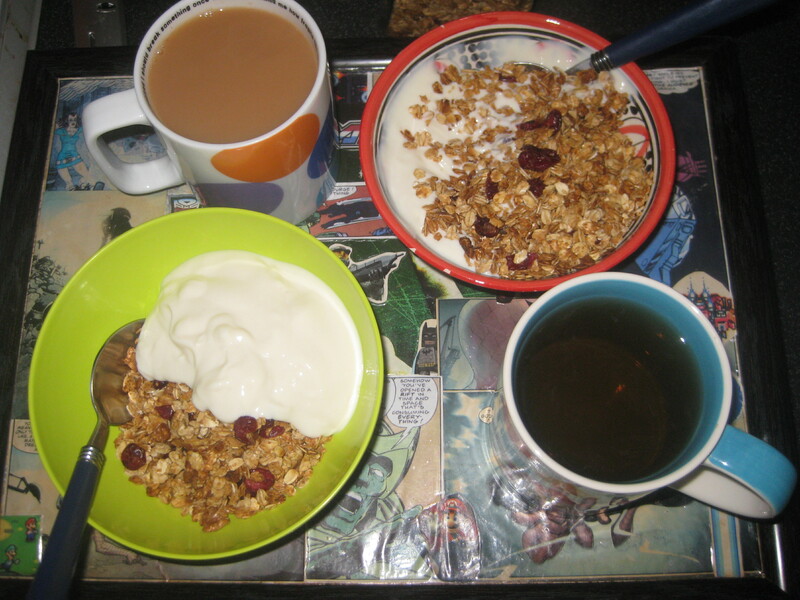 It was a really filling breakfast, with plump raisins, refreshing dried apple, and lovely cinnamon notes. The vanilla cream didn’t go as thick as I would have liked, but it tasted nice, and with some walnuts scattered on top, it had it all. I didn’t find the coconut carrot cake salad quite as delicious as the other breakfasts. 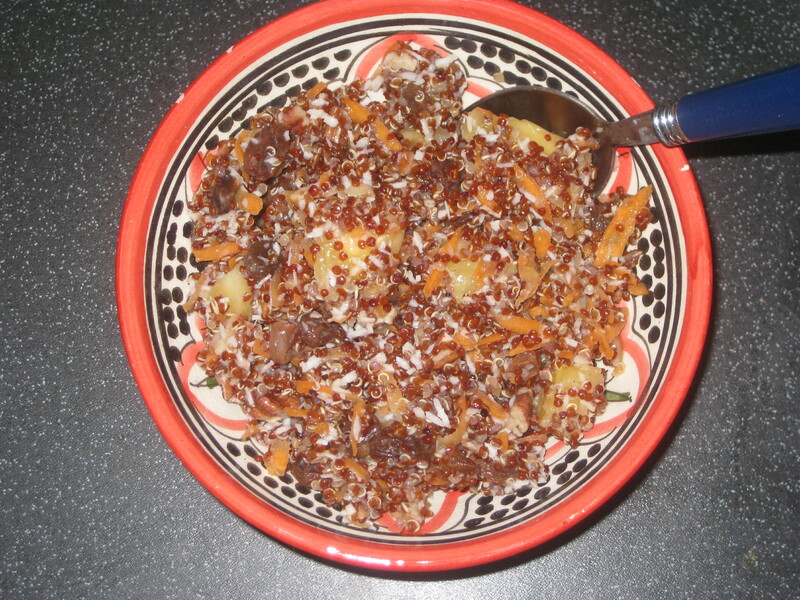 It was fine, but it was a bit more salady than treaty, with its quinoa and carrot. 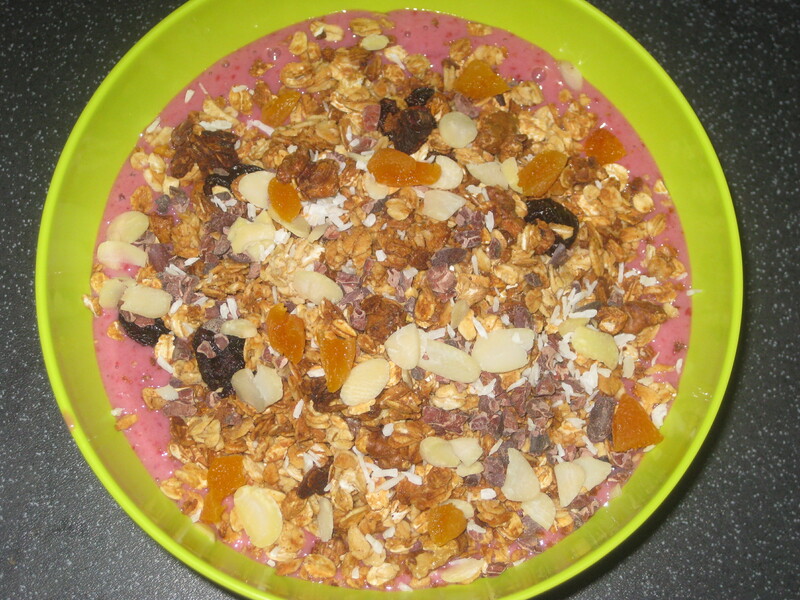 It was nice and easy, and was a healthy summer breakfast, chilled overnight and eaten straight from the fridge. Moving on to more traditional salads, this was the green curry lentil quinoa salad. This was the salad that best matched the ingredients I had in, so I decided to give it a whirl despite feeling apprehensive about the inclusion of pineapple chunks – I’m not usually in favour of mixing sweet and savoury. I’m glad I tried it though – the sweetness was not too overpowering, and was a nice balance to the fiery green curry dressing. I used spinach rather than kale, and increased the amount of tomato, and it made a lovely substantial packed lunch. 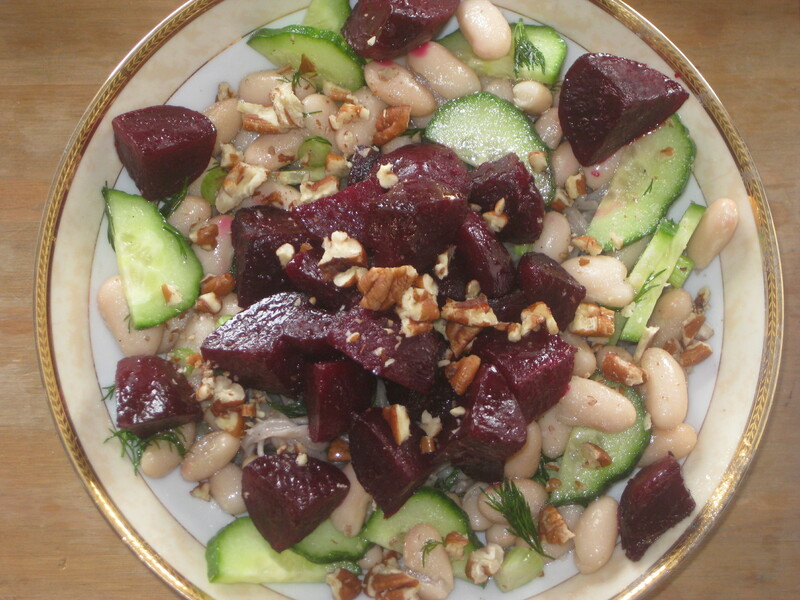 The Polish summer soba salad was a safer bet (soba noodles, roasted beetroot, cucumber, dill and beans), and it was absolutely lovely. It was so quick and easy to make, I’ll definitely whip this one out again. The blueberry tamari greens bowl was another one that was a bit of a gamble. I firmly believe that blueberries are only worth eating if they are embedded in a muffin – and even then, they’re my last resort muffin. But they worked a treat in this salad amongst the savoury taste of all the tamari and sesame. 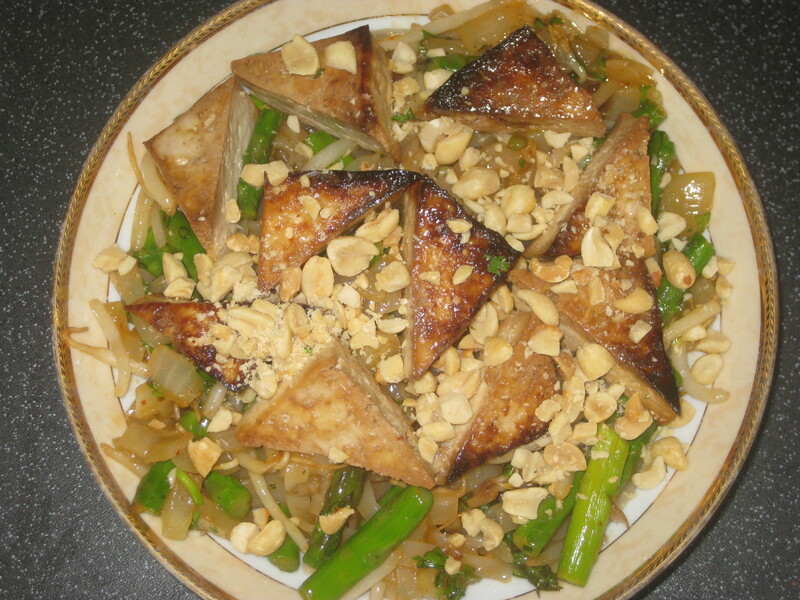 The spicy nuts and tofu were delicious, and provide a ready made response to the famous “But where do you get your protein?” question. The coconut samosa potato salad was a real treat, and it was easy to make after work. I was worried that it wouldn’t be filling enough, but far from it: there was plenty to be had, and it was full of flavour. 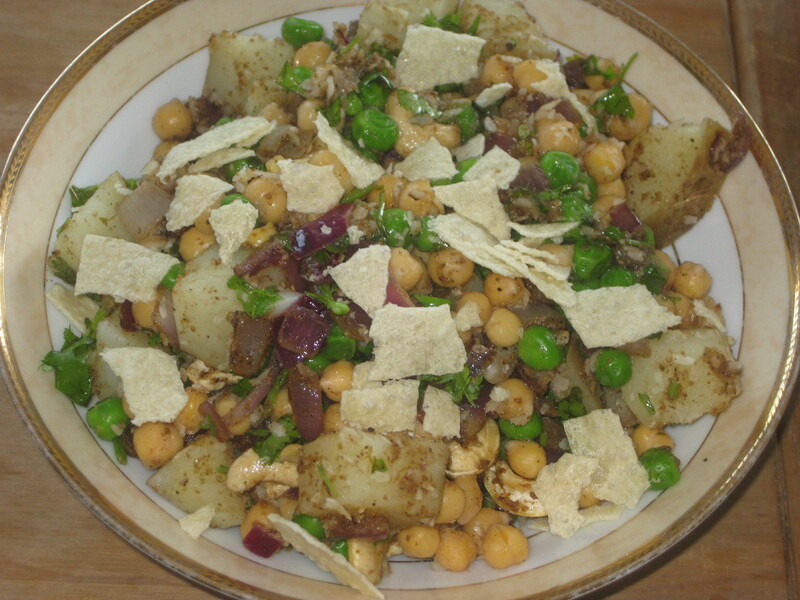 Good textures again, from the crunchy papadum to the chunky chickpeas and the tender potato. And it did resemble a samosa! 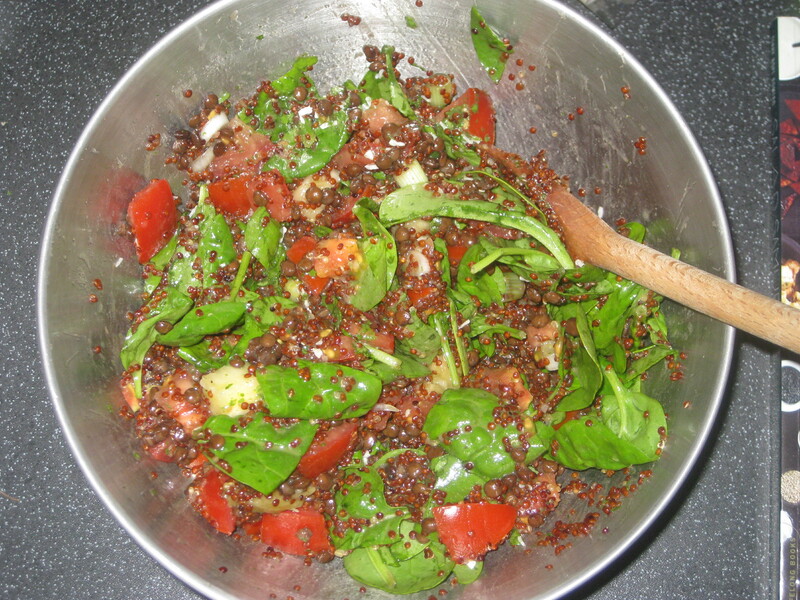 Another packed lunch was the strawberry spinach salad with orange poppy seed dressing. This looked so tempting and colourful, but again, I was somewhat daunted by the combinations. The fruitiness wasn’t too sweet at all, everything was juicy and refreshing (perfect as I ate this on one of the hottest days of the year in Manchester). 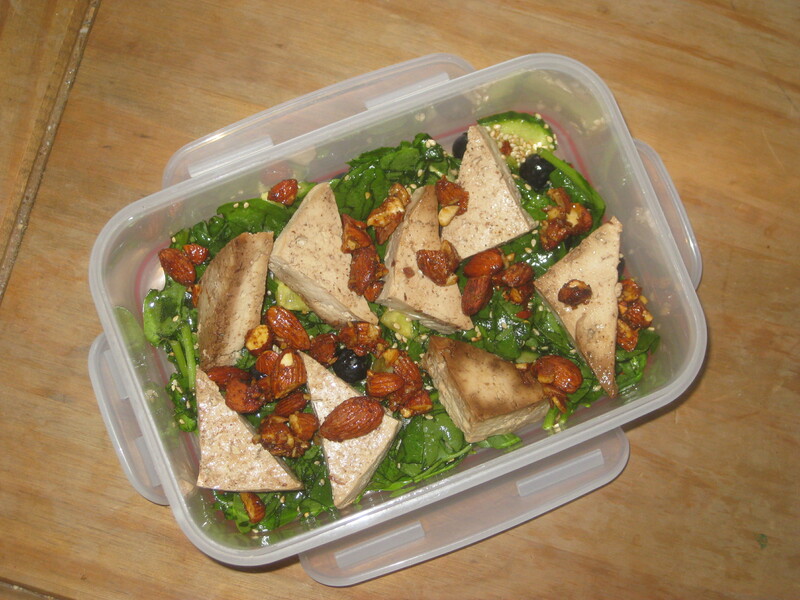 Of course though, the highlights were the spicy nuts and the baked tofu. I’d had my eye on the asparagus pad Thai for ages, and I’m glad I finally got round to making it. Mr HH was especially delighted with it, making joyful exclamations about how the flavours, textures and colours were all spot on. There was plenty of it: noodles, asparagus (I just chopped mine, rather than attempting to peel it into ribbons and no doubt savaging my fingers in the process), lemongrass tofu, a delicious sweet and spicy dressing, plenty of fresh herbs, crunchy bean sprouts, and salty peanuts sprinkled on top. I think it’s cheating to call it a salad really. So, it’s quite a lean month of cooking, but I’m going to get back on it in September. I have a lovely new kitchen which is beginning to get some good use, and I’m building up my supply of kitchen staples again. 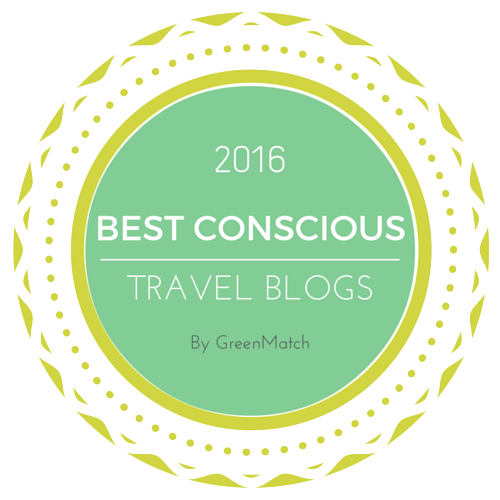 And with Vegan Mofo just around the corner, I’m getting ready for a lot of blogging too! 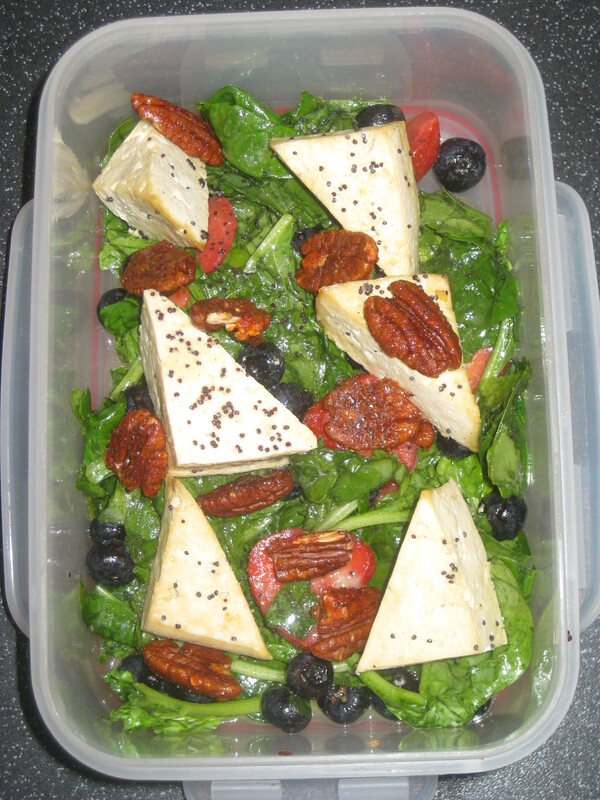 This entry was posted in Cookbooks and tagged cookbook of the month, Salad Samurai, vegan cookbook, vegan salads. Bookmark the permalink. I went back into your archive because it occurred to me you might of done a Salad Samurai review (and you did! XD) I love seeing what other people made and liked (or hated) Funny that you start with all the breakfast foods, since that is the last chapter. I kept forgetting they had breakfast foods, they should of put them in the front in my opinion. I can imagine they were tasty, I liked the breakfast stuff from Protein Ninja. I always start with breakfast! 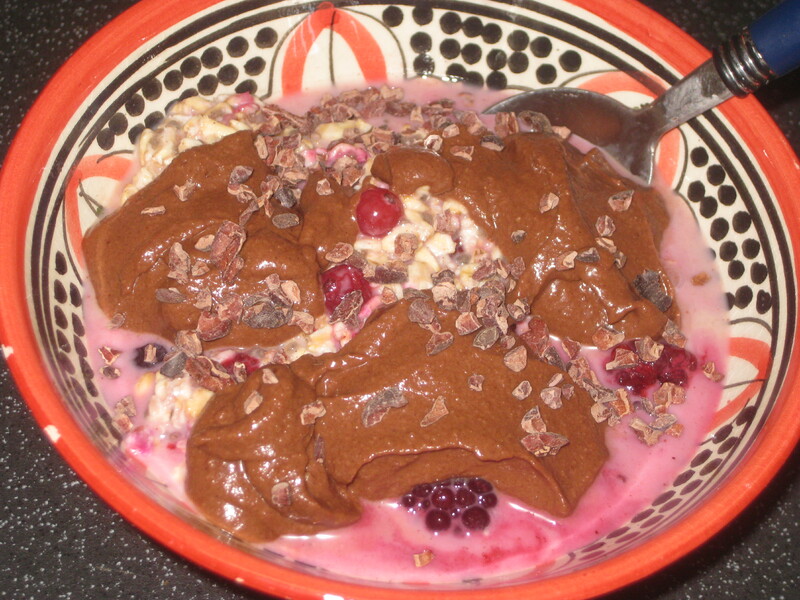 The overnight oats with Mexican chocolate cream is still my go-to summer breakfast.